Printer accounting for student eAccounts in computer labs is being implemented to provide an equitable facility for limiting excessive printing, but to allow students to print academically related materials for their courses in the labs. The system is necessary to defray the rapidly growing cost of printing, reduce waste, and to encourage students to conserve scarce paper resources. The Pharos system functions transparently to the student as long as they have a credit balance and are printing jobs fewer than 30 pages (a document over 30 pages is termed a Large Print Job). 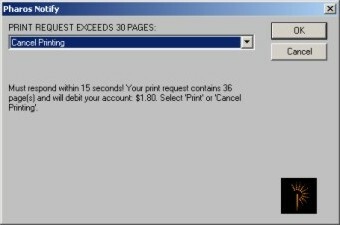 Pharos handles the printing chores of the computers in the Student Labs by processing a print request and calculating the number of pages for the job, then debiting the student's ID Account. A confirmation popup window will appear to provide the details that the job was printed and to which printer. Students are provided with 35 pages per credit hour that they are enrolled (i.e. a student enrolled for a full course load of 15 credit hours will receive 525 pages per semester), this allocation is referred to as the Tech Fee Printing account. The allocation is made per semester and does not roll forward. If a student exhausts their allocation they can purchase additional pages at the Card Value Centers (CVC) located on the Library first floor. Once a student's Tech Fee Printing account is exhausted, an insufficient funds message will be returned detailing that additional pages (referred to as Copying/Printing account) may be purchased at the Card Value Centers in the Library. Students can use the CVC's to check the Copying/Printing balance in their account. The Copying/Printing account balance is also used for copying. To add credit to a student Copying/Printing account a valid Student ID (obtainable at the Auxiliary Services Office in Occhiato Student Center Rm 102) must be used. Print jobs that are over 30 pages in size will require a confirmation to print. This is designed to protect against inadvertently printing a large document that could significantly deplete the Tech Fee Printing account. The following window will appear and "Print" will have to be selected within 15 seconds or the window will close and cancel the print job without debiting the Student's account. "Cancel Printing" may also be selected to immediately cancel the job. The Pharos system makes provisions to handle errors in printing as intelligently as possible. If for some reason the print process does not work correctly a pop-up message similar to below will be displayed. Please contact the Helpdesk at 549-2002 to report the problem immediately so it can be resolved and your request can be printed. If your print job does not print, DO NOT RESEND PRINT REQUEST or your Tech Fee Printing account may be charged for each print job submitted. Please contact the Lab Monitor or the Helpdesk as outlined in the pop-up below. Furthermore, do not turn the printer off or press the Cancel Job button on the printer. This will result in the print job being deleted - the Tech Fee Printing account will still be charged for the print job. A Web-based interface for checking the account balances is available in the PAWS Student Services from Current Students at http://www.csupueblo.edu/current-students/. Login using your PID and PIN. Select ID Account Balance. You may view the account balances for the Tech Fee Printing account and the Copying/Printing account along with Fiesta Cash and Bookstore Bucks. The Copying/Printing account may also be checked at the CVC's by selecting the "View Acct Balance" key from the display. The Tech Fee Printing account is allocated per semester and does not roll forward. The Copying/Printing account balance is neither transferable nor refundable. The Copying/Printing account remains for the duration of a student's enrollment.